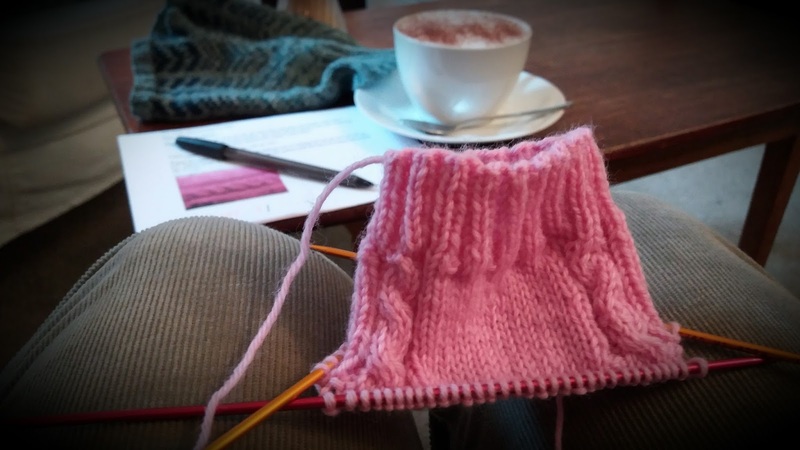 Cafe knitting is still going strong. They know me now on a Thursday. Walking in, they bring me a cappuccino without me even asking. It is the best coffee I have all week. It is good to have a craft-on-the-go project in a zippy bag. Every Thursday I have an hour to kill between work appointments and sock knitting fits the bill perfectly. These cable knit socks were easy to do but gave a little knitting interest. The yarn is actually Sirdar snuggly four ply which was given to me about six years ago in a gargantuan quantity, probably about ten balls. 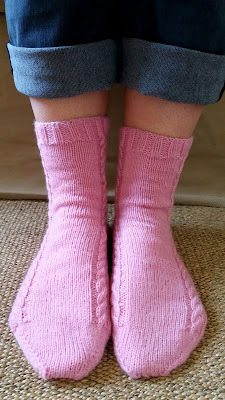 My mum and I have used it to knit little girl things over the years but my girls have outgrown this kind of pink now so I am using up what is left over to make bed socks as pressies. 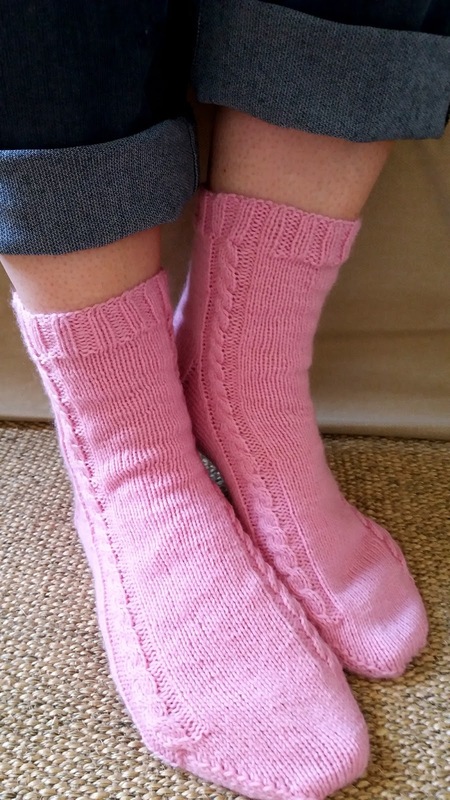 The pattern is FREE from Colourful life and Christina's sock patterns are easy to follow and I highly recommend them. 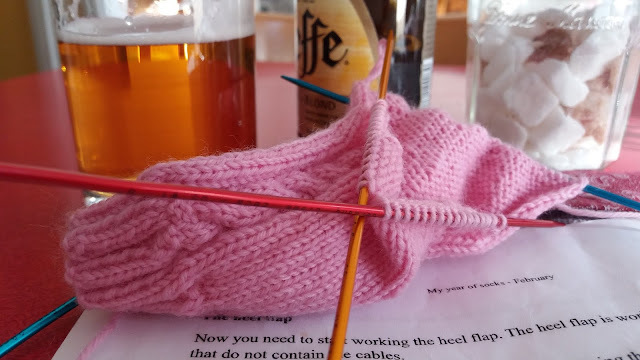 I got distracted on sock number two and started some new projects. I had to hunker down and do a few more rows wherever I could. I even had a beer in a cafe whilst waiting for a friend one Friday evening. Got there eventually! These ones are going into the present chest ready for Christmas(Smug! )They are sporting these rather natty paper bands sourced free online which you can find here. They are for my friends daughter who will be 18 this Christmas. I have made many things for her over the years, some of which I have had to stand a bit of friendly teasing for, so this band makes a fun finishing touch. I am sure she won't mind me modelling them just this once, they were so snuggly, it was hard to prise them off. PS. Not knitting related but please, please go and look at a make on this blog - it is awesome! Love the fact you are making christmas presents already, that means I can too and not feel guilty about it. Have popped over to see your friends fabulous make and yes you're right it is awesome. Have left a comment for her. The paper band is fun, I never thought of presenting socks up like this. I get so many good ideas here! Thanks. 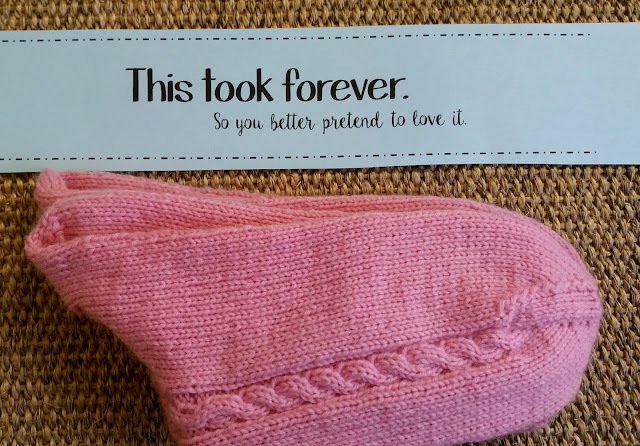 Those socks look great. Not a pink person myself but that is a lovely shade. Hopped over to the blog recommendation what a clever girl she is and that anorak has turned out beautifully. I see Big Sis there in a few years. 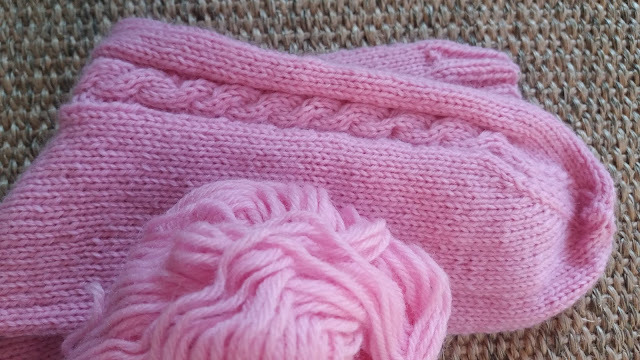 I've never grown out of pink, that looks just the colour for a hat or lovely scarf. Very pretty. I would not even have to pretend to love them I really love them. And I am a pink fan, you will make someone very happy with them. Cafe knitting is one of my ultimate goals (although my knitting ability will have to be much better before I can attempt to do that)! 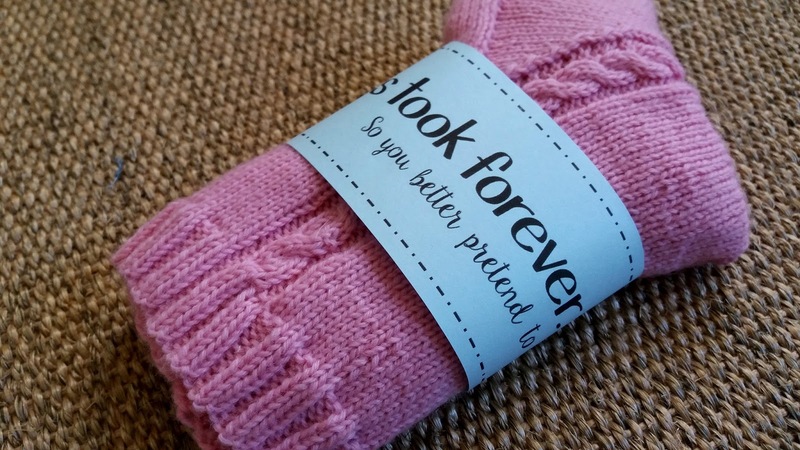 These pink socks are lovely. Thank you also so much for linking my anorak, it was so kind of you! They are just absolutely lovely. 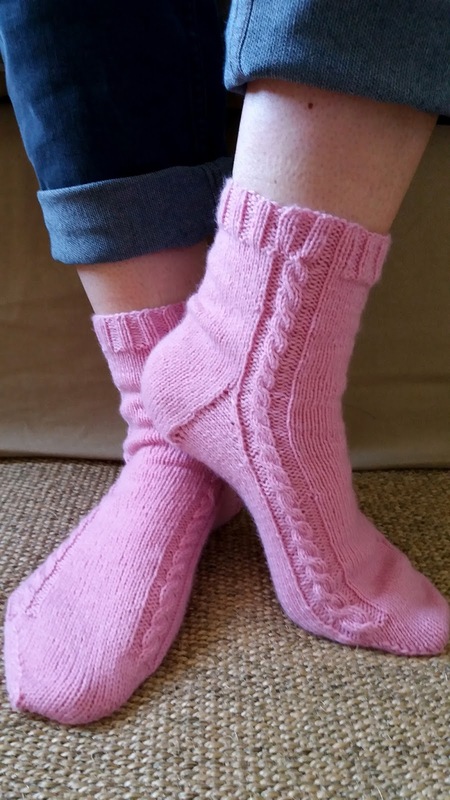 I still feel like I have as much chance of flying to the moon as I do knitting socks, but I love to see what you make. That cable is perfect.